LBJ……..Oswald was the fall guy. I think it is pretty clear why Lee Oswald assassinated John F. Kennedy. JFK was a Liberal Democrat, a cold warrior, a strong believer in liberal democracy and freedom for the individual. And by the time his life ended, he was in favor for freedom and equal rights for everyone. Which included non-Caucasian-Americans. Which put the Far-Right at odds with President Kennedy, who perhaps didn’t see him a strong threat before. And the Far-Left in America, which included Communists, that didn’t like President Kennedy’s tough cold war anti-communist stance against Russia and Russian allies. Promises, Promises! Talk is cheap, action is impressive power. US senator Graham threatens to defund UN over Palestine bid | The Times of Israel. New World or One World Order, they’re all in it; most anyway. It all started when I stumbled across “Coast to Coast AM” (a radio show played late at night) in college and ever since, I have been hooked. Now, to clarify I don’t buy most of what I hear, I really don’t….but what I have found is that in most conspiracy theories, there is a tiny bit of truth. The truth often spins into a blown up crazy wacko story that no one believes, but often, if you dig deep, and research….you’ll find that lot’s of those conspiracies out there, have some legitimacy. This would appear to be more than coincidence. It is a reflection on Obama that he is surrounded by jackasses. Like birds of a feather flocking together, jackasses apparently run in herds. 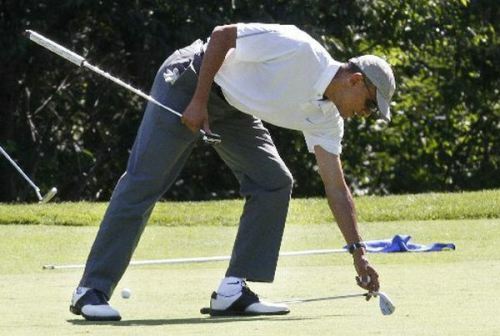 Obama may not have known about the parties plans to hold their wedding on the 16th tee, but course management and Obama’s asses would have known and obviously did not care. In fairness to Obama (Ugh) he did the right thing, which is rare and apologize to the newlyweds. We should not be making such a big deal over this, I believe there are graver issues before us, but at the same time it shows a lack of consideration for others on the Obama Asses; however, nobody died. The media however, searching for whatever, made a big deal out of it. Give it the 15 minutes, then move on. If the newlyweds are okay with it, why shouldn’t we! I am so fortunate! Thank God!